Sick of cracked, rotten, and unstable wooden jack pads for your RV? Want to do a little project that will make you feel accomplished and provide a long-lasting solution? The good news is making your own plastic jack pads is an incredibly easy project that virtually any member of the “DIY” community can do! Fabrication of a couple pads for your RV should take 15 minutes or less. 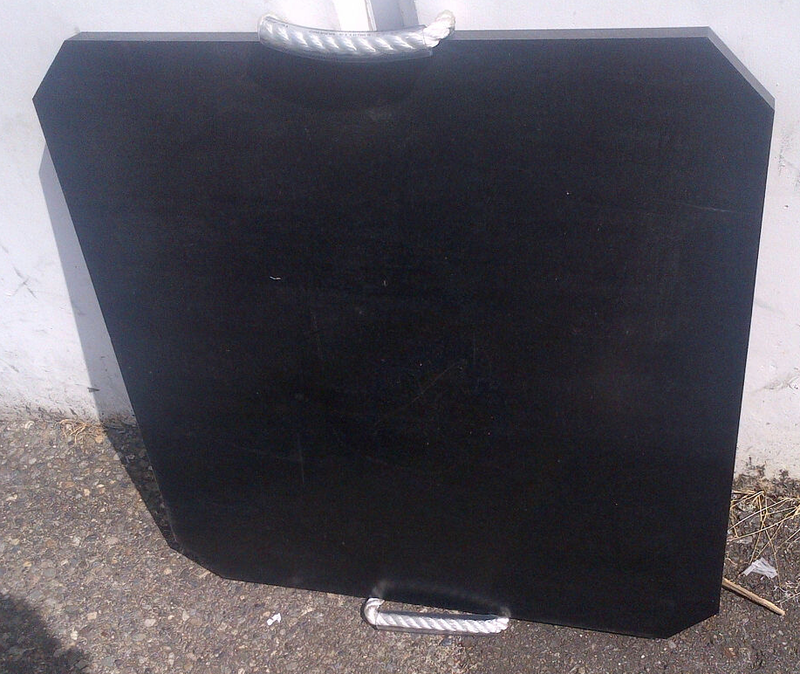 -(1) 12″ x 24″ x 0.75″ (thick) piece of UHMW black-reprocessed plastic. -(2) pieces of rope 1/2″ in diameter 12″ long. -Power drill with 3/4″ bit. The bit should be at least 1.25″ long. Measure with a colored marker or tape the halfway point on the UHMW plastic. You want to simply cut it in half to obtain two 12″ x 12″ pieces. One of the pieces may be undersized but that is not important for this application. Cut the UHMW in half. Find the midpoint on each pad again. Mark it. On either side of your mid-mark, 1″ in, make two points 2.5″ on either side of that line. Drill thru-holes with your 3/4″ bit in those two marks. stick a piece of rope through the holes. Tie knights on each end wide enough that the rope cannot get pulled back through the drilled holes. *Optionally you can then cut the corners off the pads. There you go, you have two jack pads that should last as long as you have your RV! Estimated cost per pad would be $35.00 including materials but they would likely retail around $70.00+ for an equivalent pad were you to buy them.